One of my goals with canning this year is to create a pantry filled with things I can use to pull together a meal over the winter. I found this recipe in the Better Home and Gardens Canning magazine and it seemed perfect to use with a pork tenderloin or pork chops. In fact, I had a bit leftover after canning and used it with pork chops that night. Gerry proclaimed it to be a “keeper” so I know we’ll enjoy this again and again over the coming months. Yield: I got eight pints from this recipe. Peel, core, and cut apples into 3/4 inch wedges. Place wedges in lemon-water mixture as you slice them to prevent browning. Combine water, sugar, rosemary, thyme, pepper, and salt in a large pot. Bring to boil, stirring to dissolve sugar. Drain apples and add them, and the onion, to the sugar mixture. Return to boiling, reduce heat, simmer uncovered for 5 minutes. 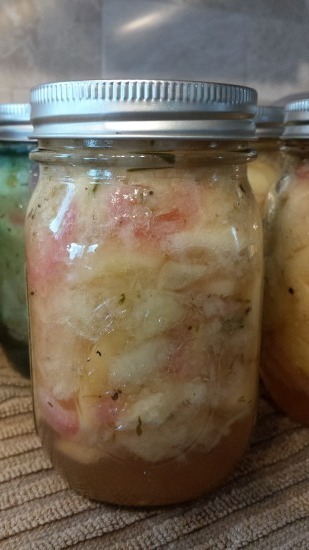 Pack hot apples and onion into hot pint jars leaving 1/2 inch head space. Ladle hot syrup over apples and onion, maintaining the 1/2 inch head space.